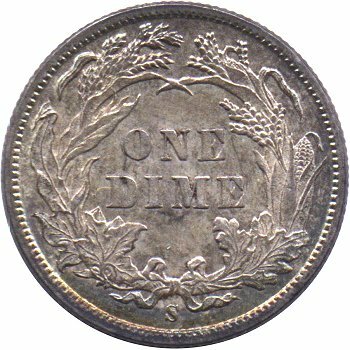 Selecting the Top 100 Liberty Seated Dime varieties was no easy task. 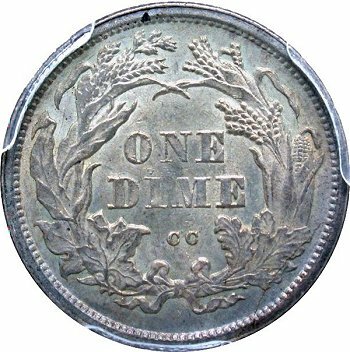 Before starting the selection process, I thought it best to first define the desired numismatic goals and outcomes for this Seated dime web-book section. 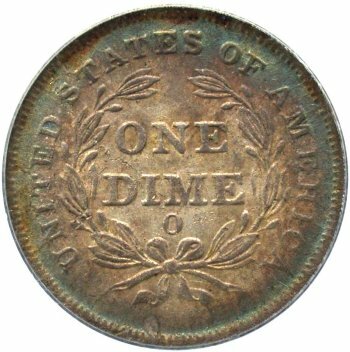 By understanding the basis for picking the Top 100 Varieties, hopefully web-book users and variety collectors would tackling this advanced collecting challenge. 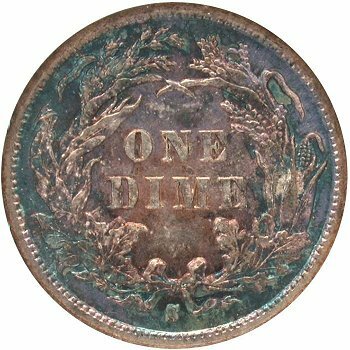 Following are the numismatic outcomes that I hoped to accomplish with the Top 100 Varieties set objective. 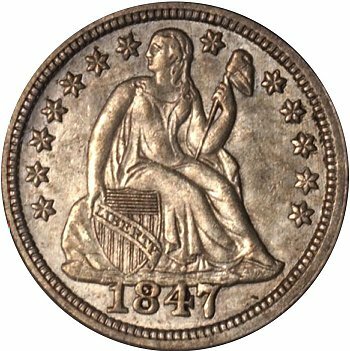 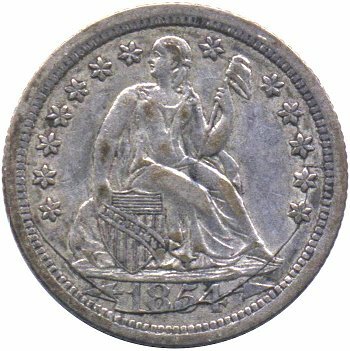 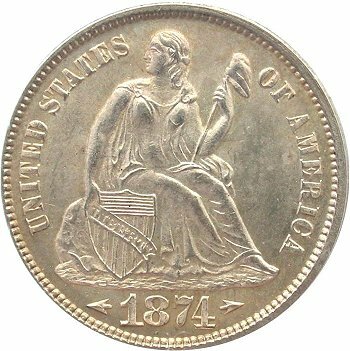 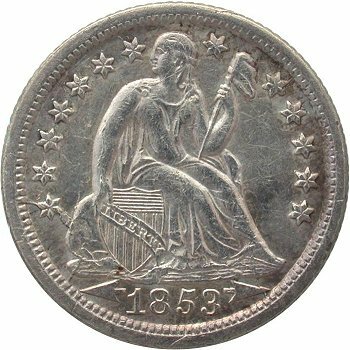 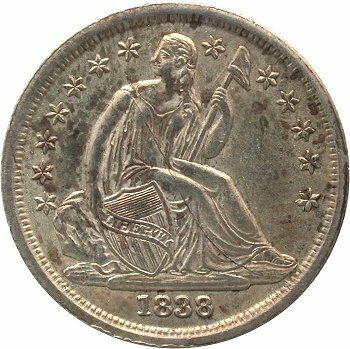 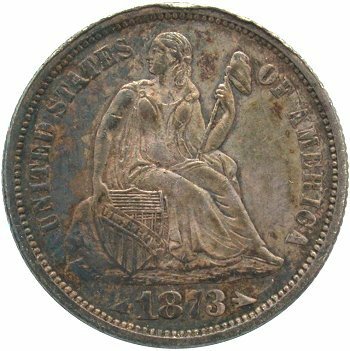 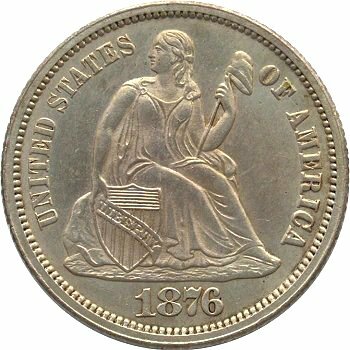 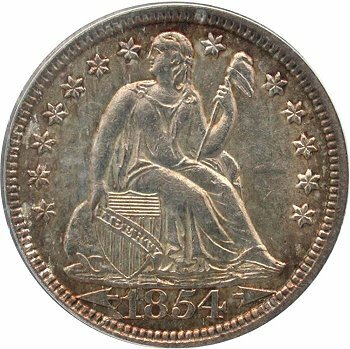 - Expand the size of the Liberty Seated collecting community by raising awareness of an alternate collecting approach for Liberty Seated Dime varieties. 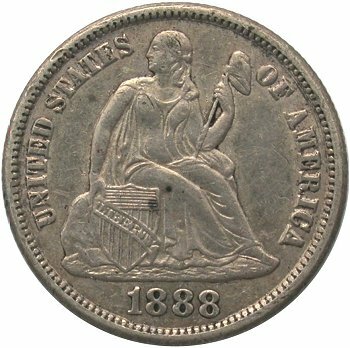 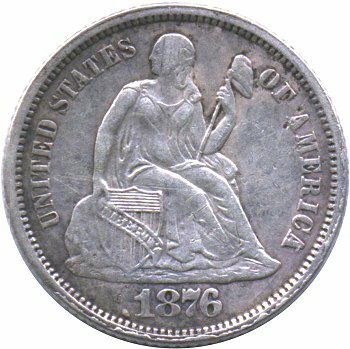 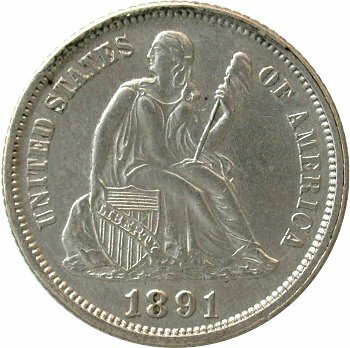 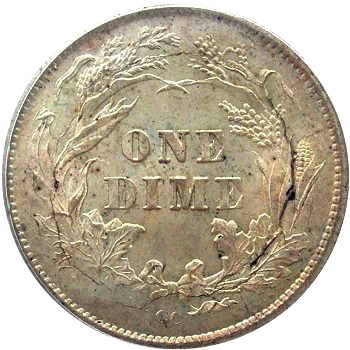 This objective would require that future collectors be aware of not only date and mintmark rarities within the Liberty Seated Dime series, but also build an understanding of the die preparation process, die wear and minting conditions in the mid 1800’s. 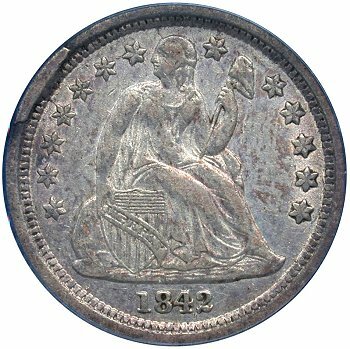 I believe that collectors will become more dedicated to a long term relationship with a particular series if time is taken to acquire in depth knowledge about that series. 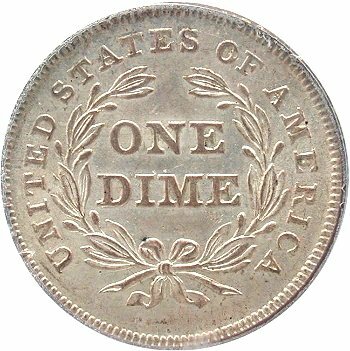 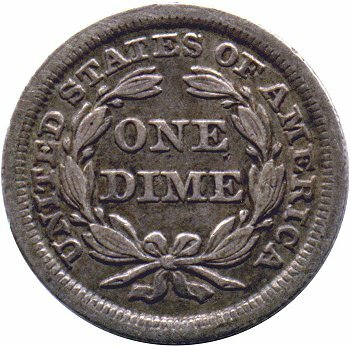 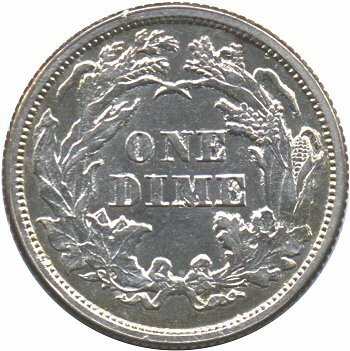 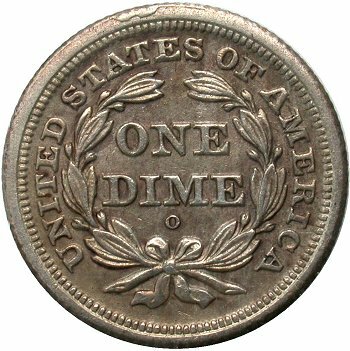 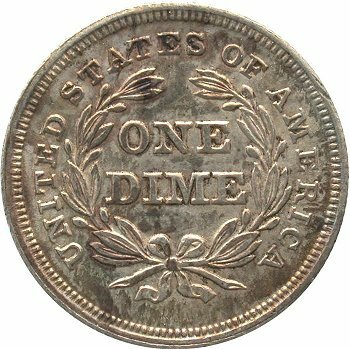 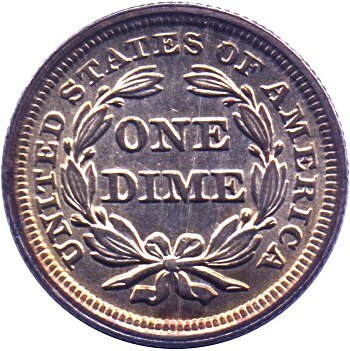 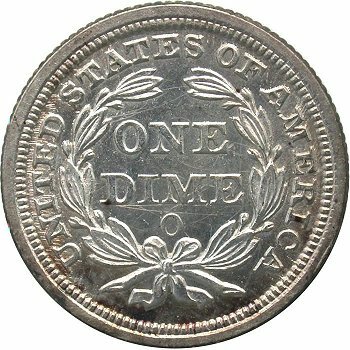 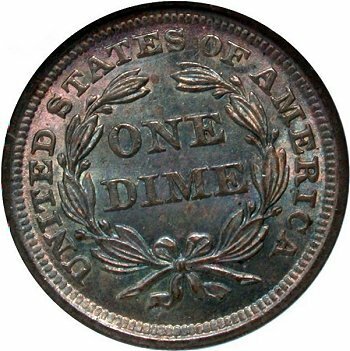 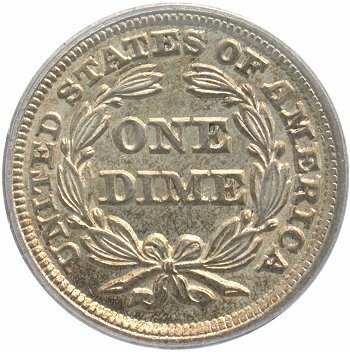 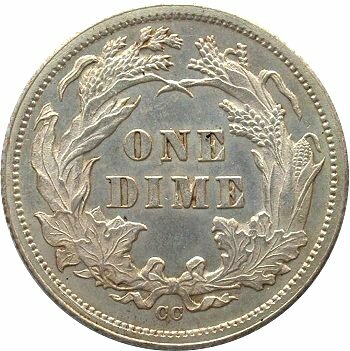 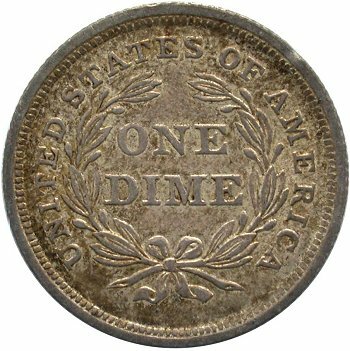 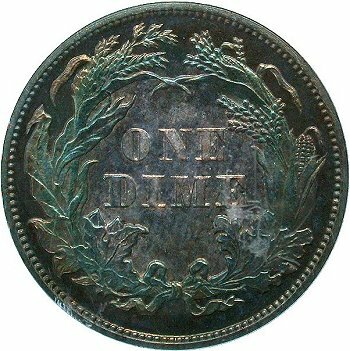 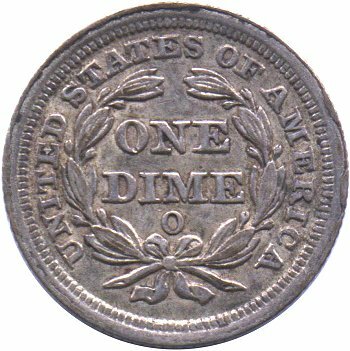 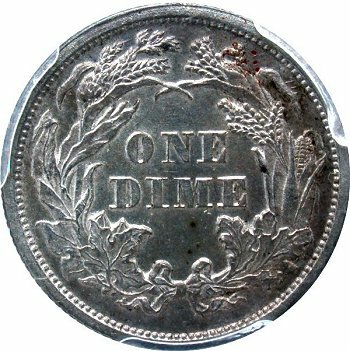 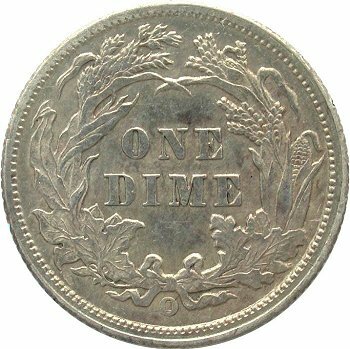 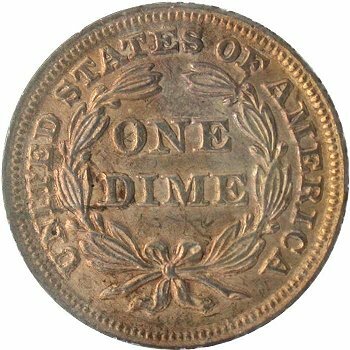 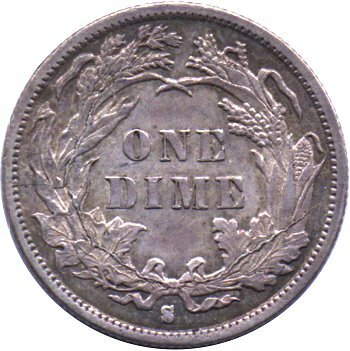 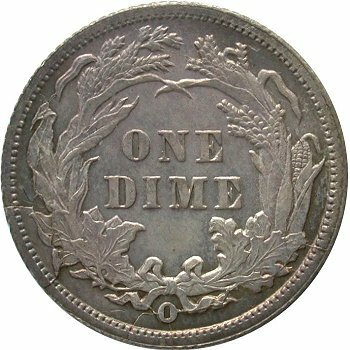 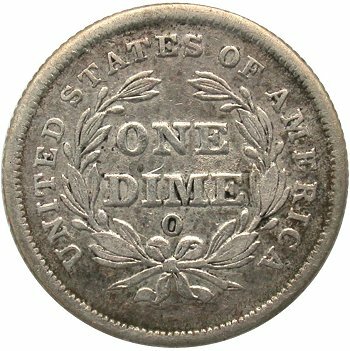 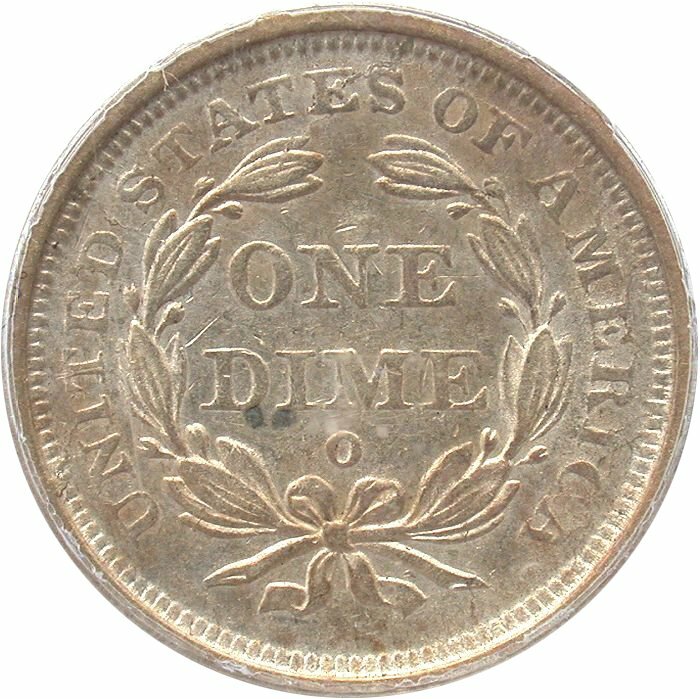 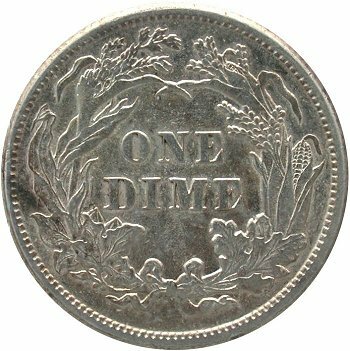 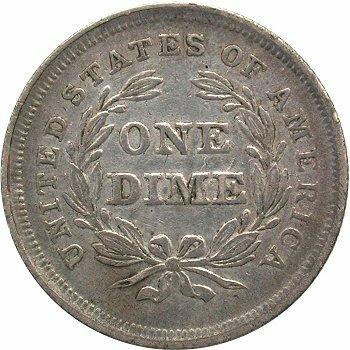 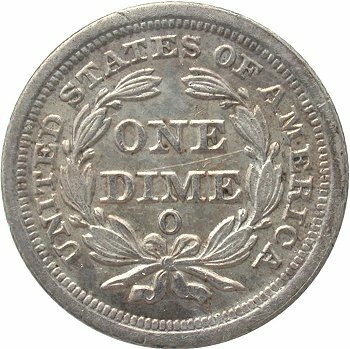 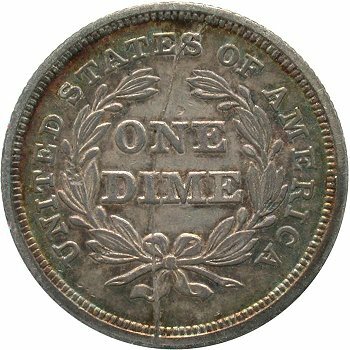 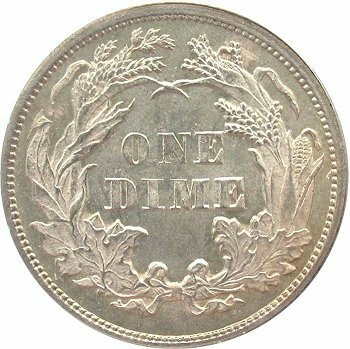 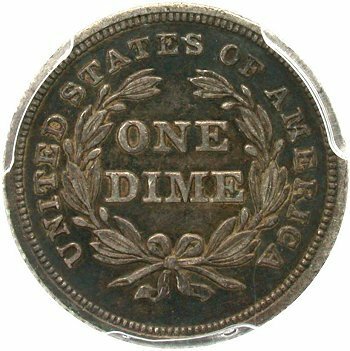 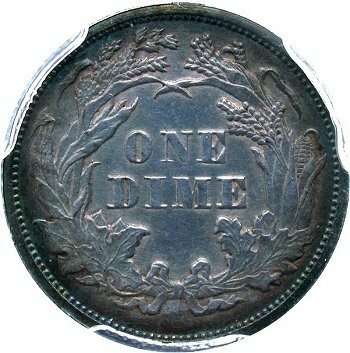 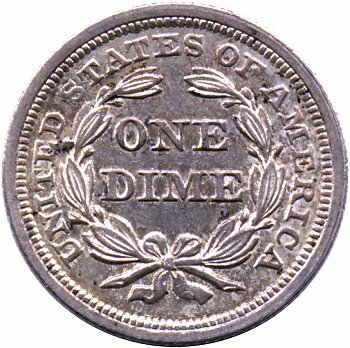 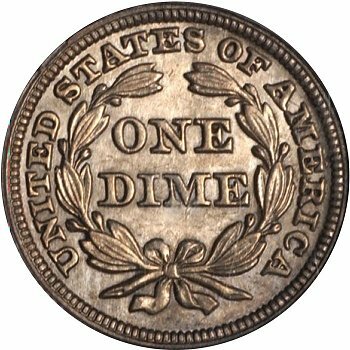 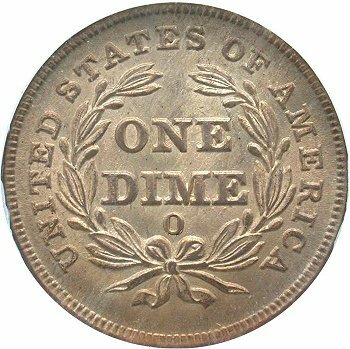 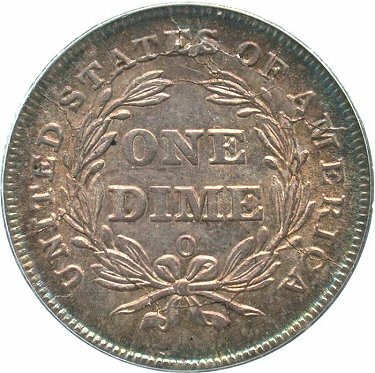 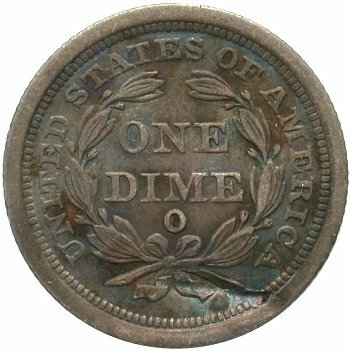 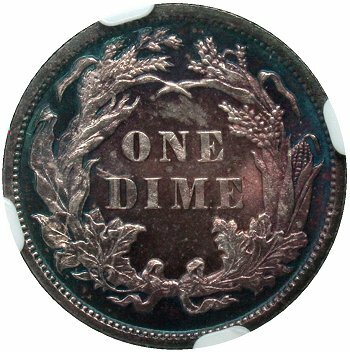 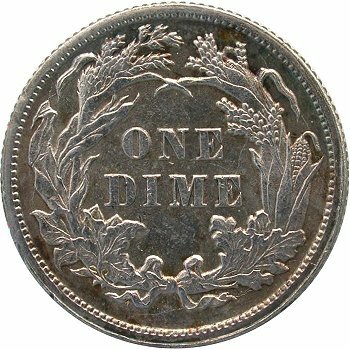 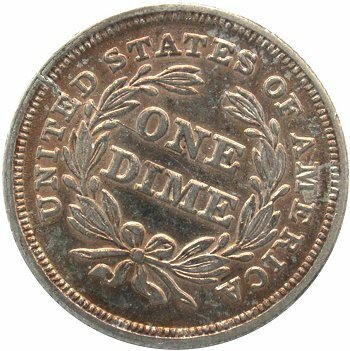 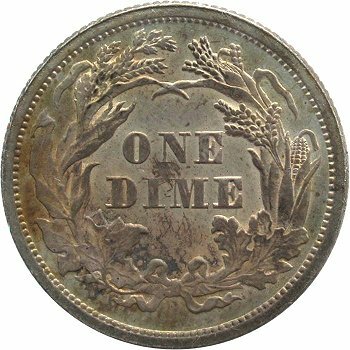 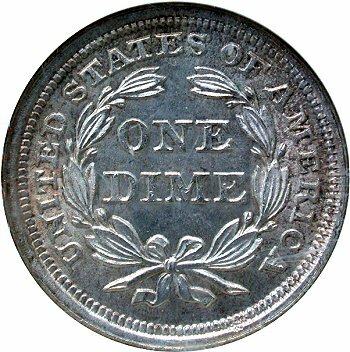 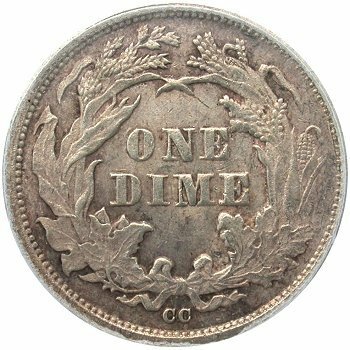 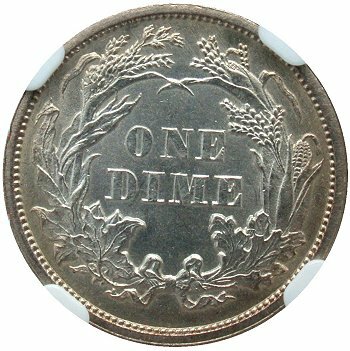 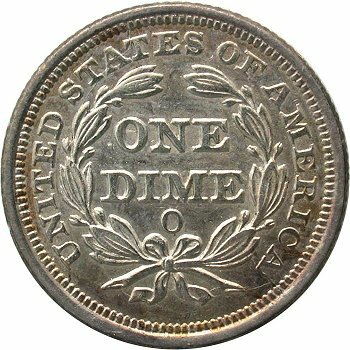 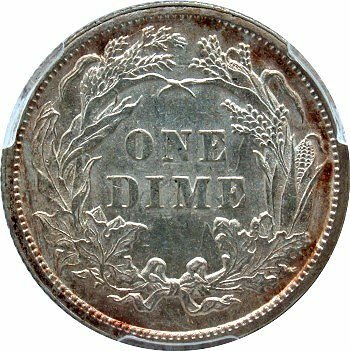 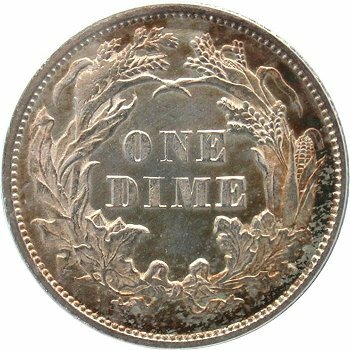 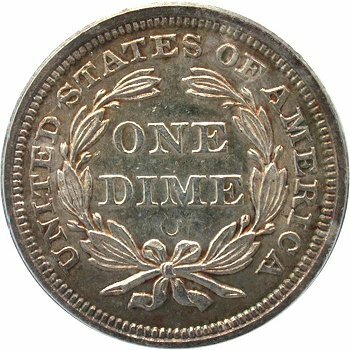 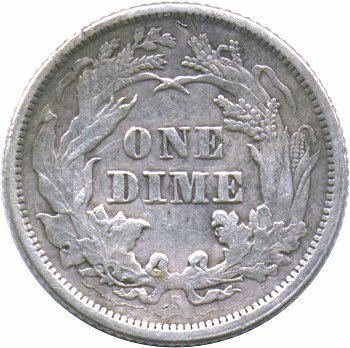 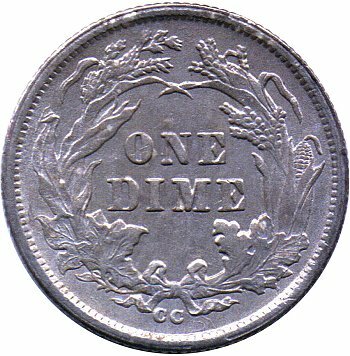 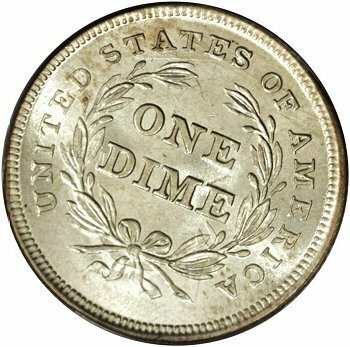 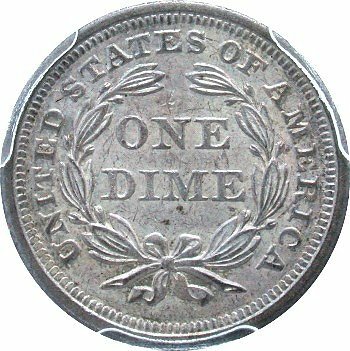 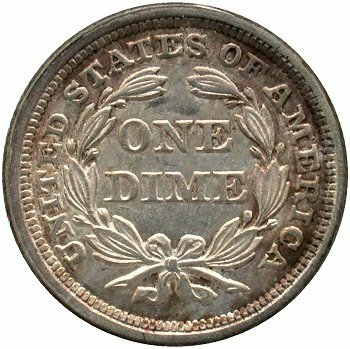 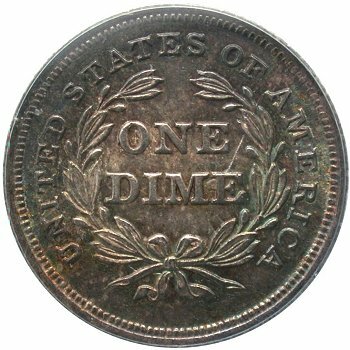 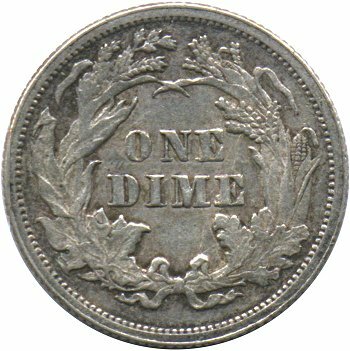 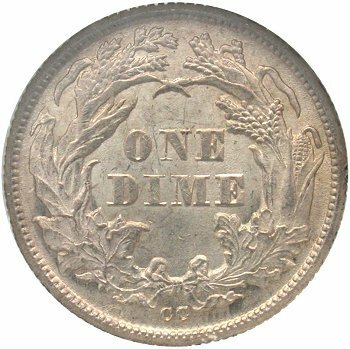 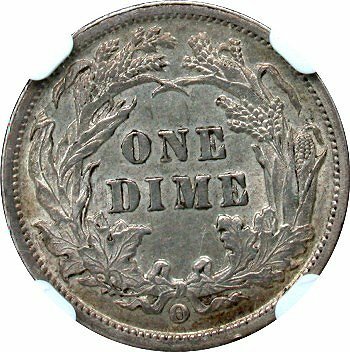 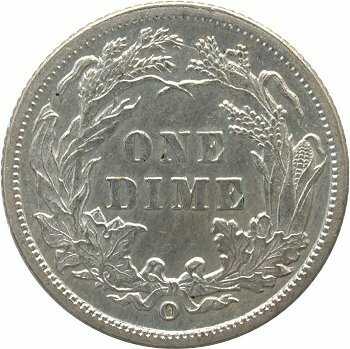 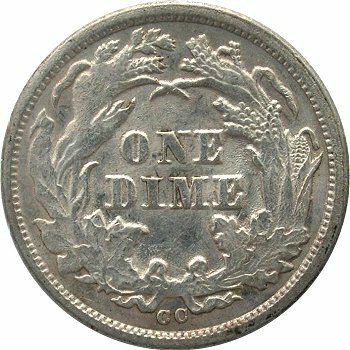 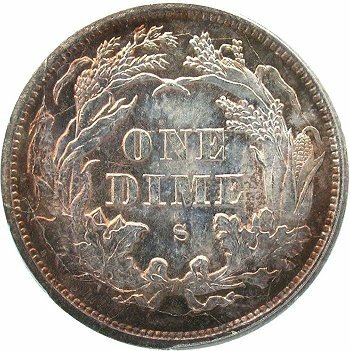 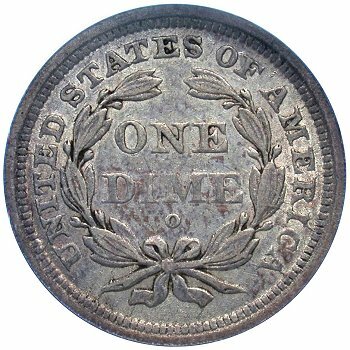 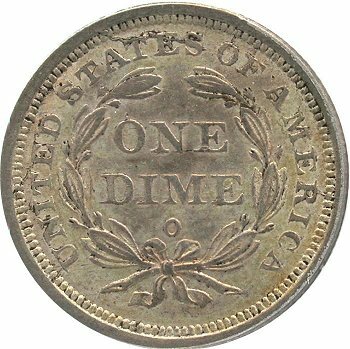 - Top 100 Seated Dime varieties to be an important cross section of die variety types universally accepted and popular with collectors of all United States coinage. 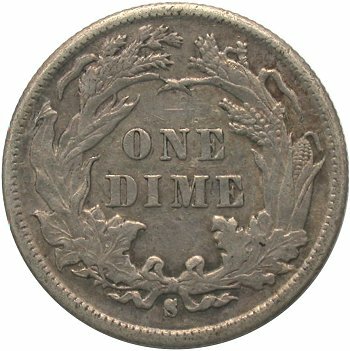 Important die variety types include repunched dates and mintmarks, misplaced date punches, excessive die wear and shattering of dies, die doubling during the die hubbing process and other important reasons that renders a variety as a highly collectable item. 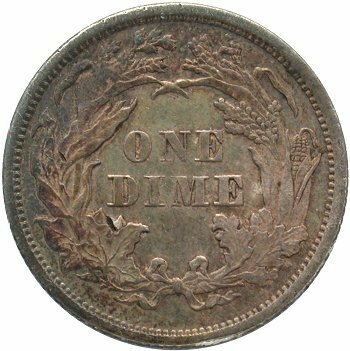 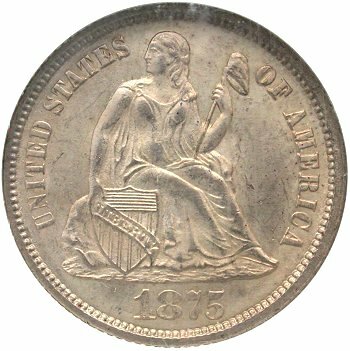 Attempting the Top 100 Liberty Seated Dime varieties should increase a collector’s working knowledge of the die preparation and minting process. 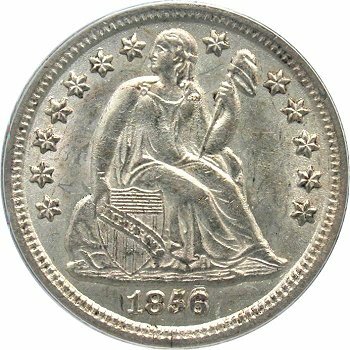 - There must be a competitive challenge, comradeship and excitement while assembling a Top 100 Liberty Seated Dime variety set. 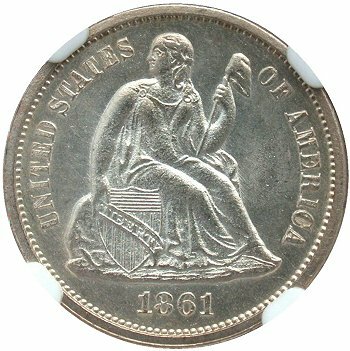 The set may be achievable in circulated or Mint State grades but at the same time, it must be a challenging long term project that brings about enthusiasm and sense of accomplishment when the set is fully assembled. 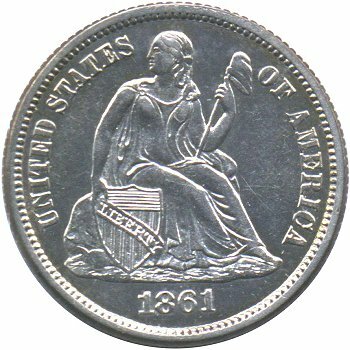 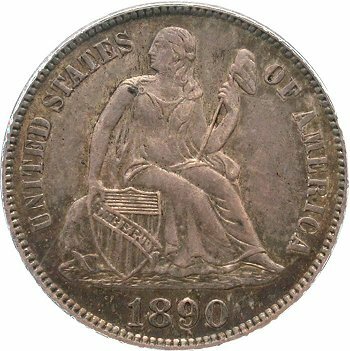 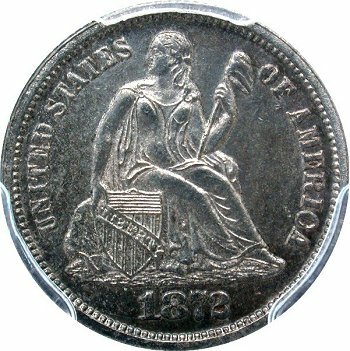 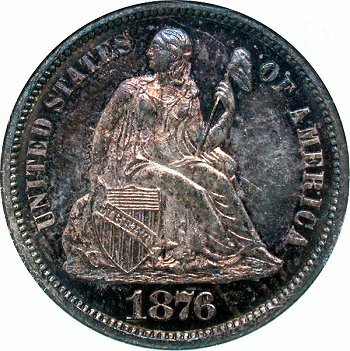 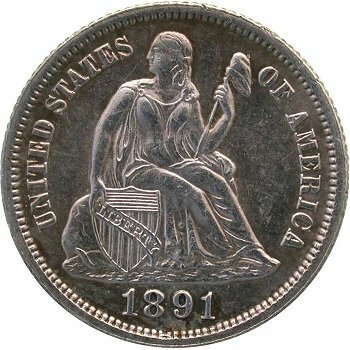 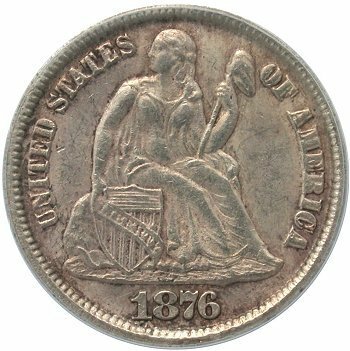 I believe that the completion of the Top 100 Liberty Seated Dime varieties set should be a major numismatic event and should be announced within Liberty Seated Collectors Club via the E-Gobrecht. 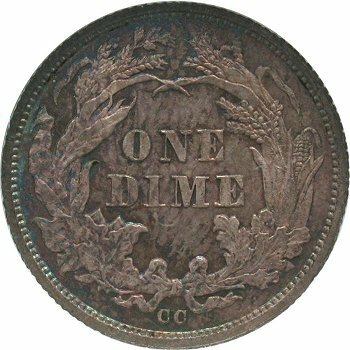 To date, only two collectors have completed the Top 100 Varieties set; Gerry Fortin and Dale Miller. 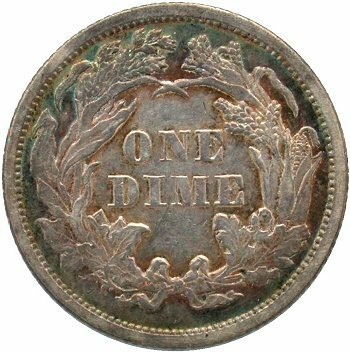 - Historically recognized as an important Liberty Seated Dime variety in prior reference books by Kamal Ahwash and Brian Greer and/or Gobrecht Journal publications. 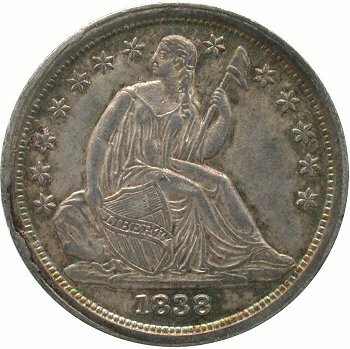 - Selecting a balance of varieties based on rarity to maintain the collector’s interest throughout the project. 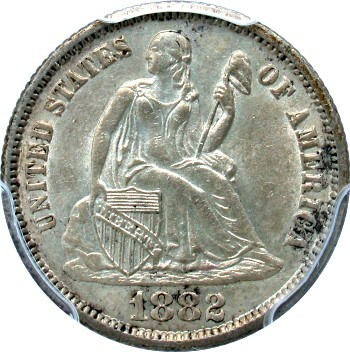 Some of the varieties should be immediately available through dealer price lists or eBay without much searching. 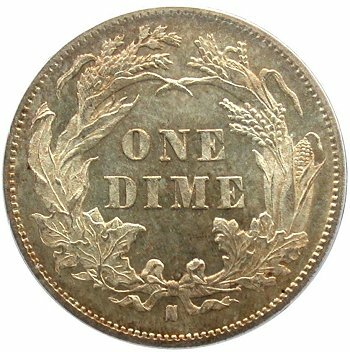 Other varieties should be moderately to extremely challenging to locate. 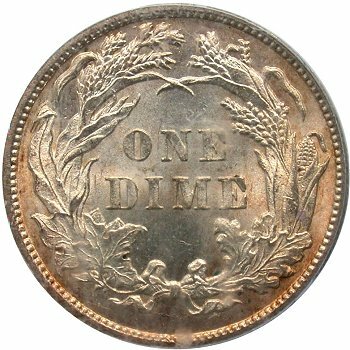 Obtaining these moderate to challenging varieties would require special attention to major auctions or building personal relationships with dealers or fellow Liberty Seated Collector Club members. 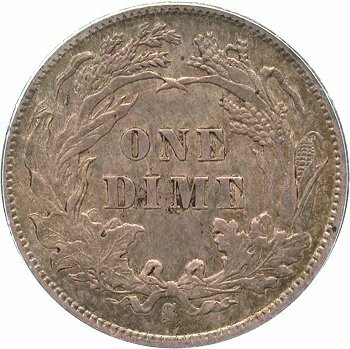 - A cross section of the major variety types currently pursued within numismatics today, again bringing attention to the die preparation process and subsequent die usage and terminal die states. 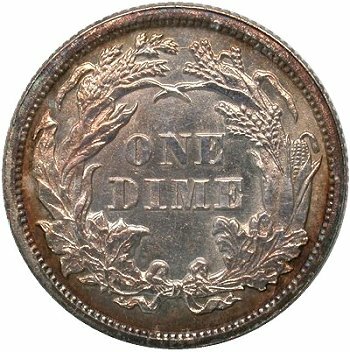 I assessed the frequency of estimated rarities, from the web-book, and determined the number of listings at each rarity level. 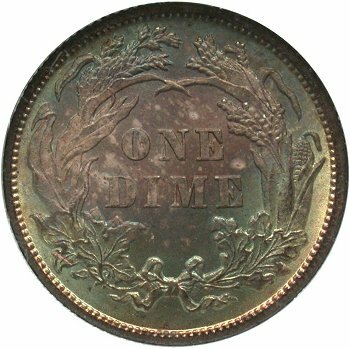 The following table illustrates the rarity level distribution for the Top 100 Varieties set. 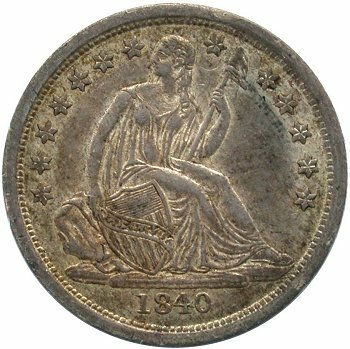 All rarity ratings are for VF or better specimens. 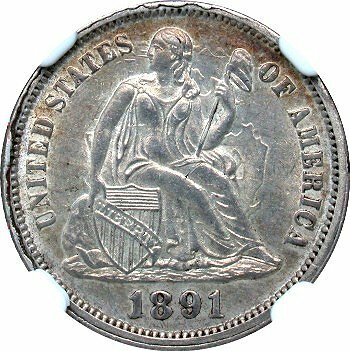 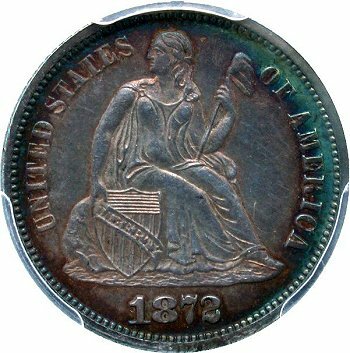 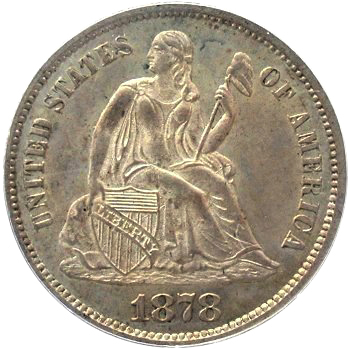 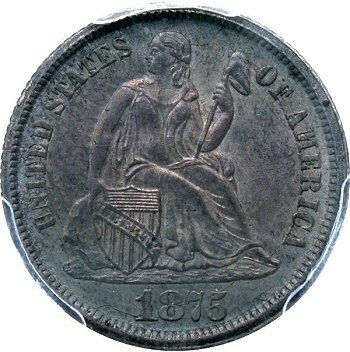 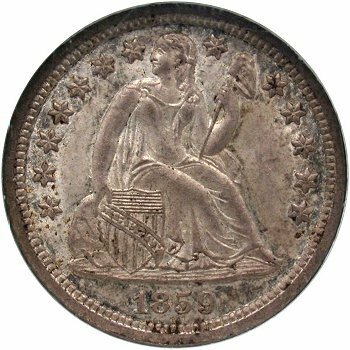 Numismatic Guaranty Corporation® (NGC®) has announced that it will now attribute Liberty Seated Dime varieties listed in the “Top 100 Liberty Seated Dime Varieties” online reference by collector and researcher Gerry Fortin. 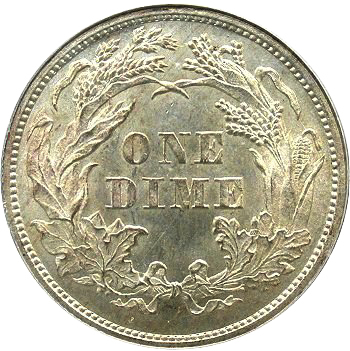 The varieties will be attributed on the NGC certification label with an “F” number under NGC’s VarietyPlus® service. 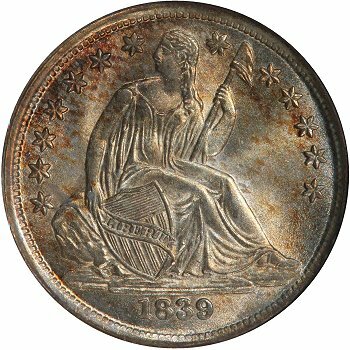 Collectors are invited to post their Top 100 Varieties set in the Open Registry. 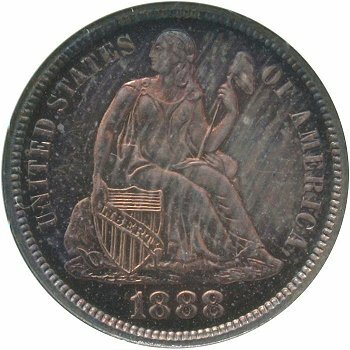 Presently, there are nearly a dozen individuals building Top 100 sets per the Open Registry list. 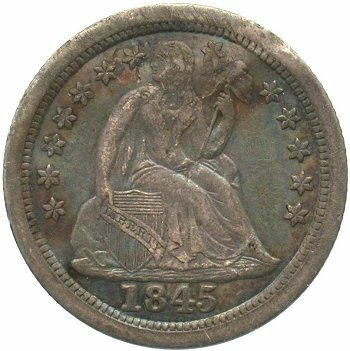 The Open Registry is a multi function online system that provides set tracking, scoring and publicity. 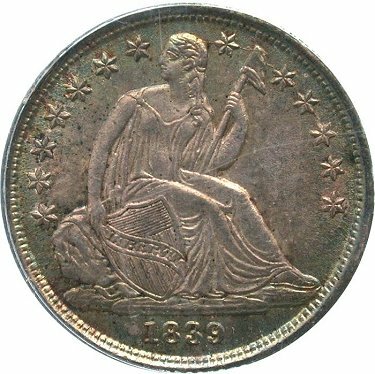 Raw and slabbed coins can be entered into the Open Registry so a set targeted in Fine grade is as important as an EF or better set with all submitted sets receiving the same display attention. 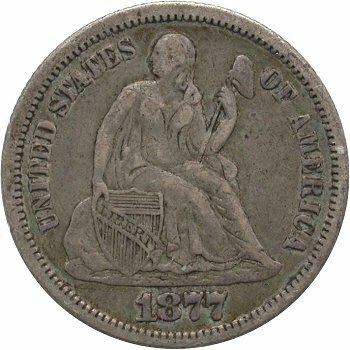 Please consider joining the Open Registry as part of your Seated coinage collecting experience. Small Stars punched on obverse intended for half-dimes, late die state obverse with heavy die crack on left side. 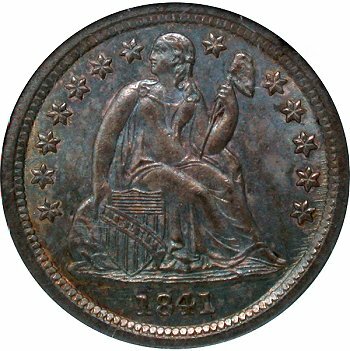 Small Stars obverse paired with a single doubled die reverse. 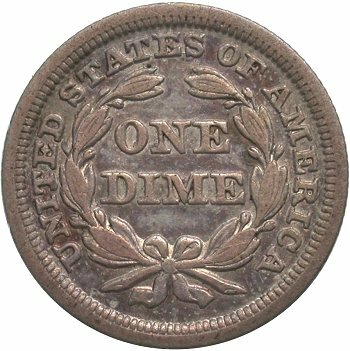 Cracked Obverse #1, die crack starts between Stars 6 and 7, then down through Liberty passing on right side of the 1 digit in the date. 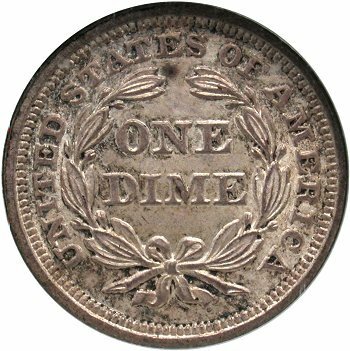 Die Clashing Resulting in "Partial Drapery"
Pie Shaped Shattered Obverse, three spectacular die cracks meeting in the center of the obverse die. 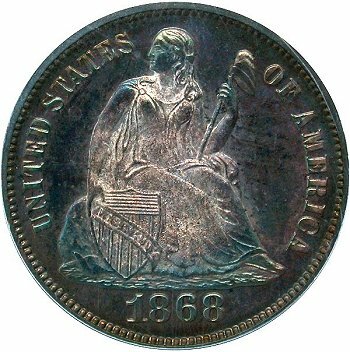 Six examples are currently known with the finest being certified PCGS AU55. 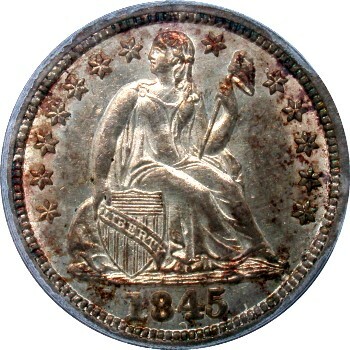 The second finest is certified PCGS EF45 followed by three in PCGS G6 and an NGC AG3 example. 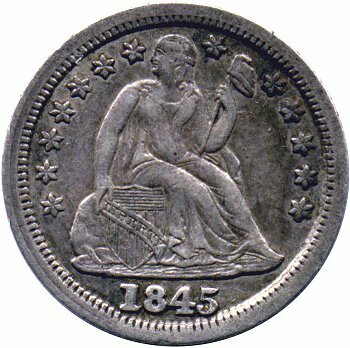 Transitional Large O Closed Bud Reverse from 1840 is paired with an single 1841 obverse die. 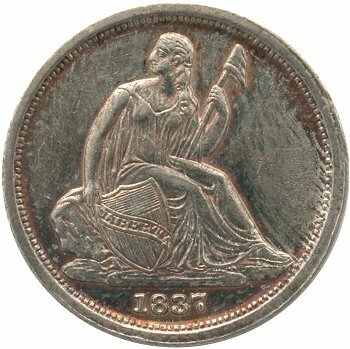 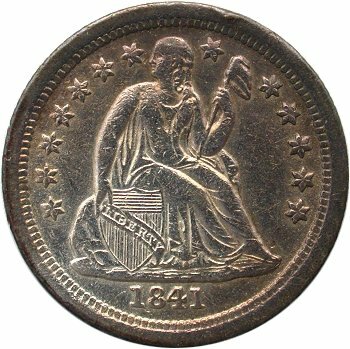 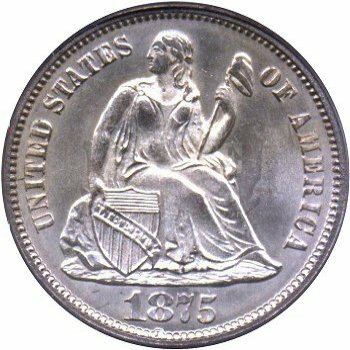 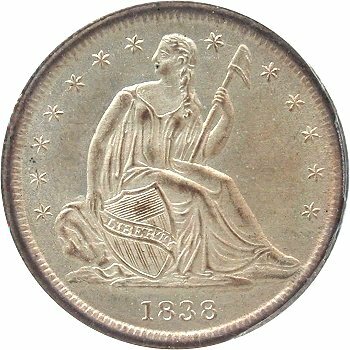 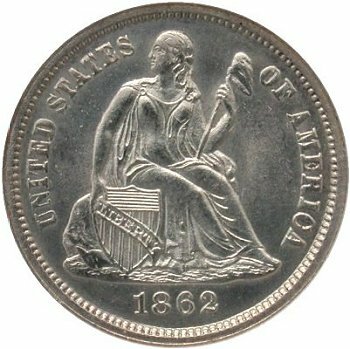 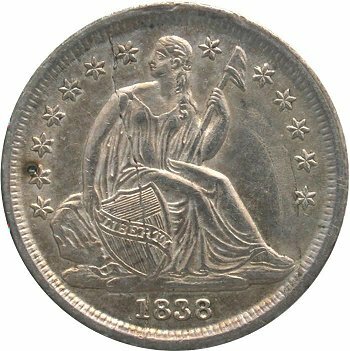 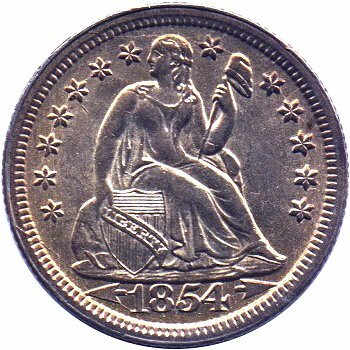 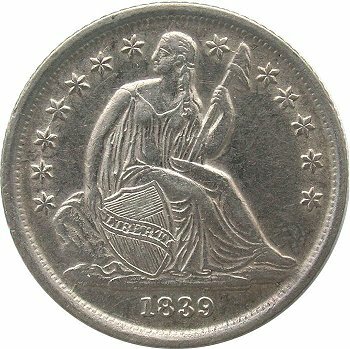 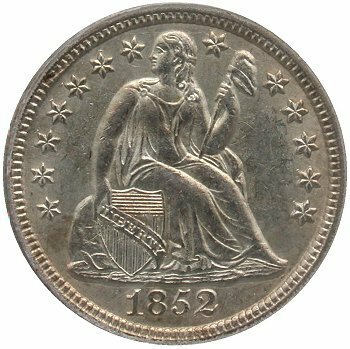 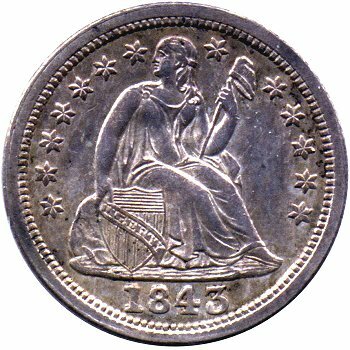 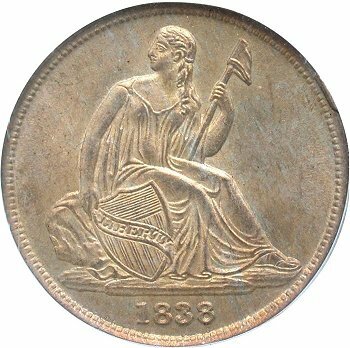 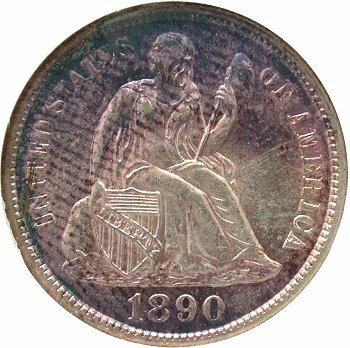 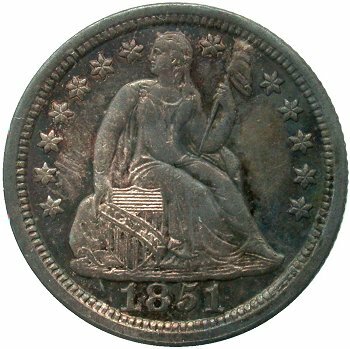 Coinage from these dies occurred during early 1841 before the Open Bud reverse dies arrived to New Orleans mint. 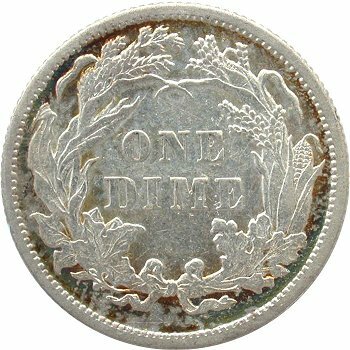 Large Thick O Mintmark, mintmark tilts right and has thick oval appearance due to die polished and die degradation. 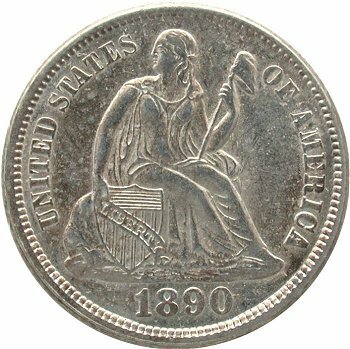 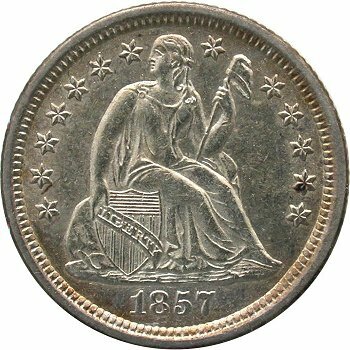 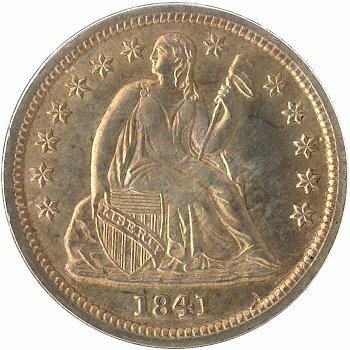 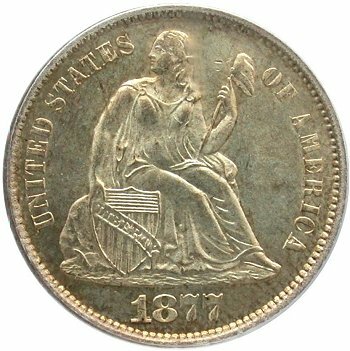 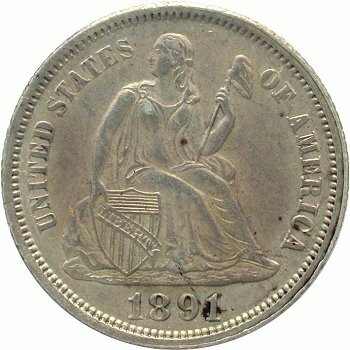 Similar change in mintmark appearance is also known for the 1852-O date and potentially the 1858-O date. 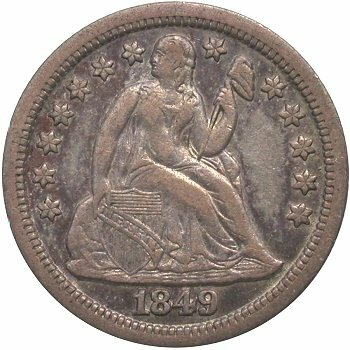 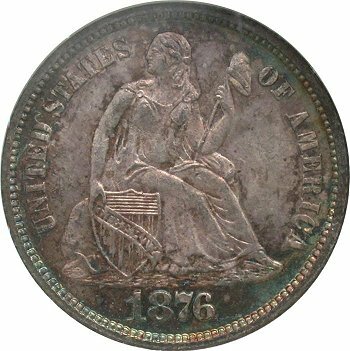 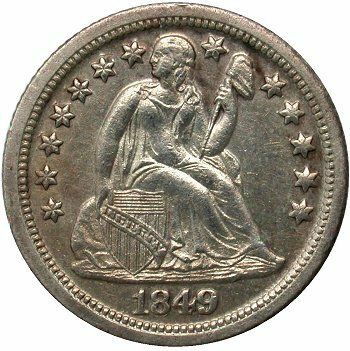 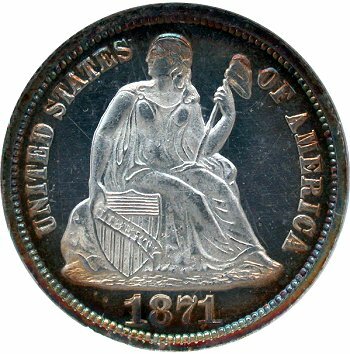 Date Punch Overlaps Base, the date punch is high and overlaps into the base on one of the three 1847 obverse dies. 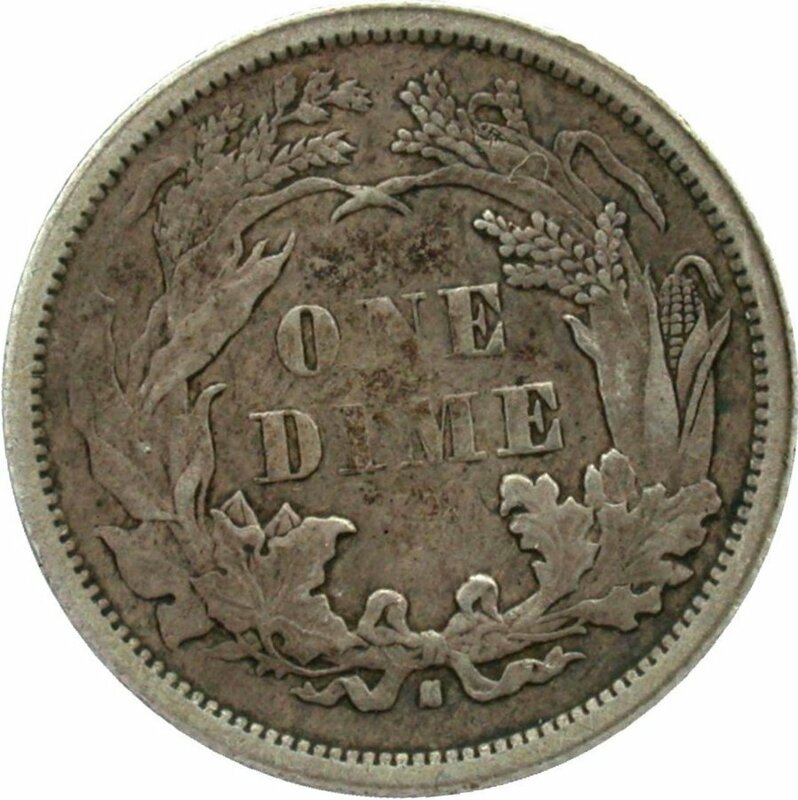 Repunched 8 and 9 Digits, previously designated as an 1849/8 overdate but current general agreement that variety is only a repunched date. 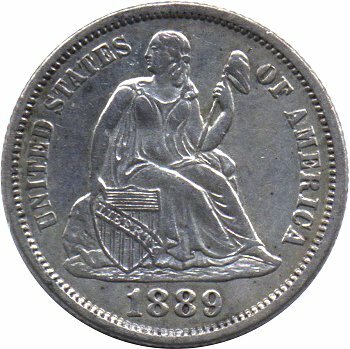 Initial 8 and 9 top loops are visible within final 8 and 9 digit loops. 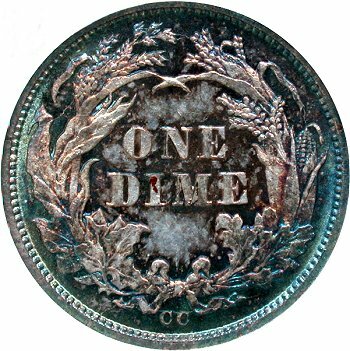 Shattered Obverse Die, a dramatic and massive circular die crack through the date and arrows with latest die states have shelf metal die crack through the date. 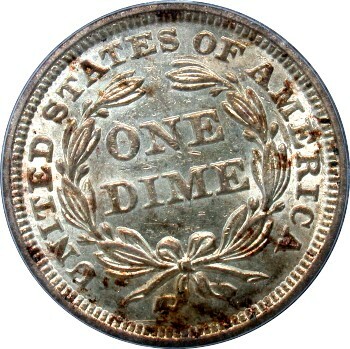 Doubled Date and Stars, the cause is suggested to be strike doubling by Gerry Fortin due to doubling on the date digits. 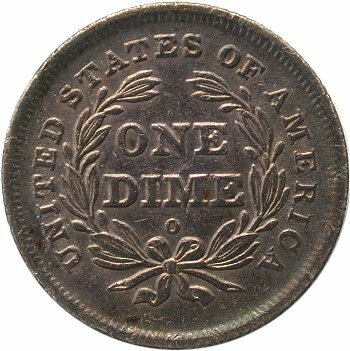 Since the date digits are punched into die after hubbing, then the doubling on date and stars can only be achieved through strike doubling. 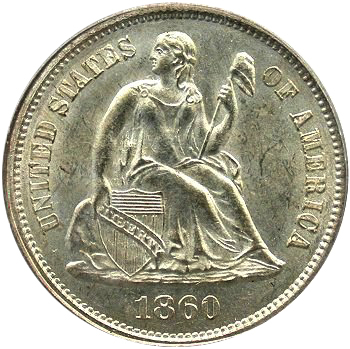 Short Flag 1 Date Punch, the required vareity is one of five obverse dies known with a short flag 1 date punch. 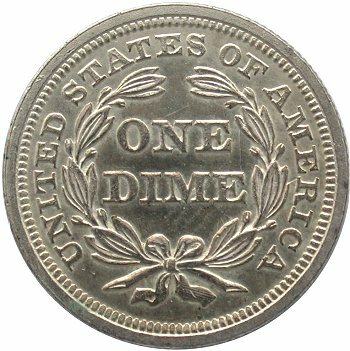 This obverse die being the most difficult to locate. 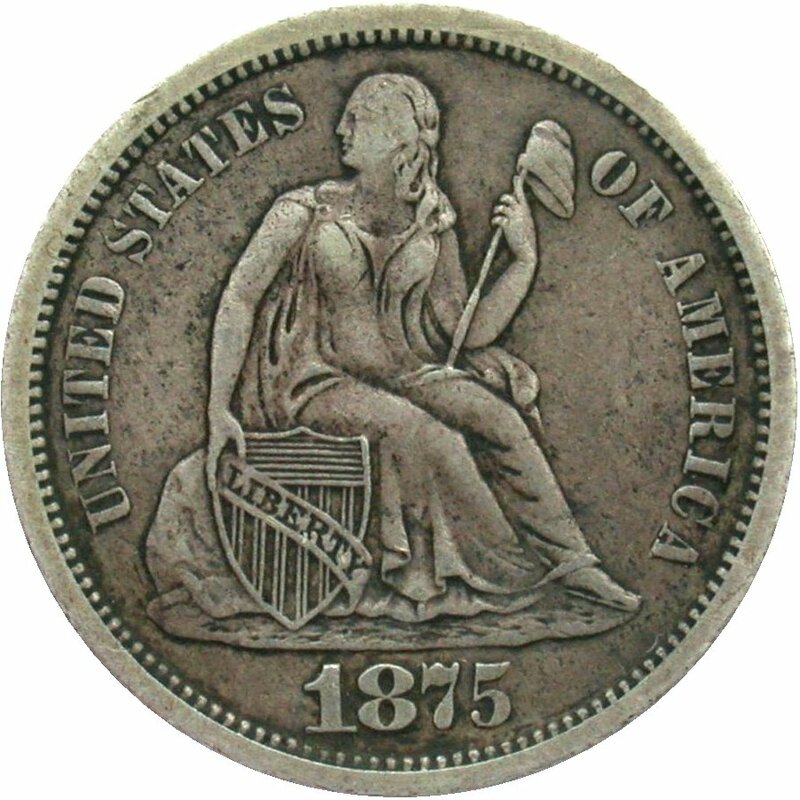 Unfilled Micro S Mintmark, Micro S below ribbon is not filled with well defined upper and lower serifs. 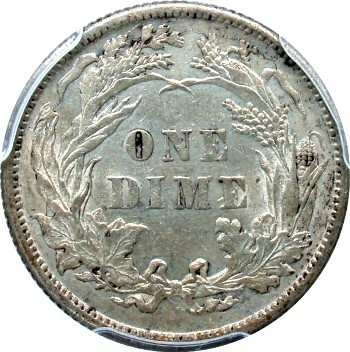 Type II Reverse, a single Type II reverse die is known for 1876 Carson City dimes with the variety being rare in circulated grades and very scarce in mint state. 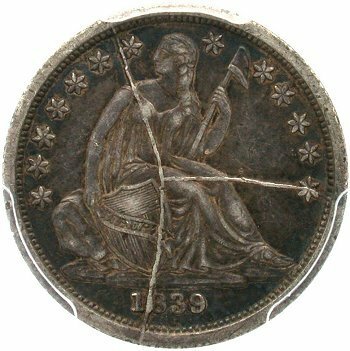 Shattered Reverse Die, spectacular die cracks form a radial inner ring that covers about 60% of the wreath. 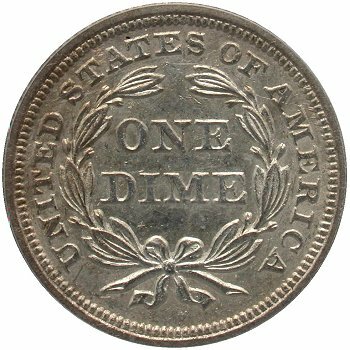 Doubled Die Reverse #1 is only paired with one obverse die. 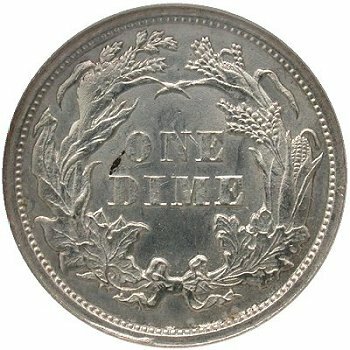 Looks for doubling in the veins of the maple leaves in lower left wreath. 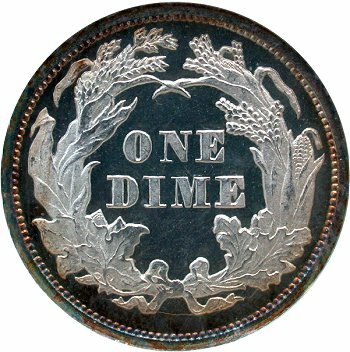 Doubled Die Reverse #3 is paired with two obverse dies. 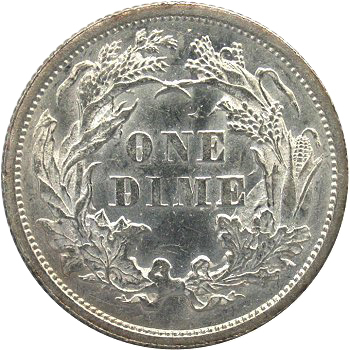 Early die state pairing is with Obverse 22 and late die state pairing is with Obverse 6. 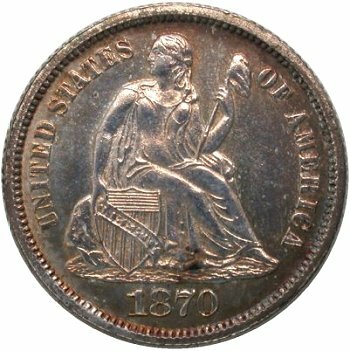 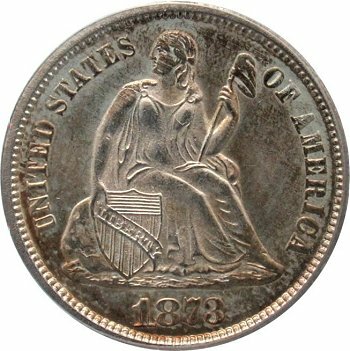 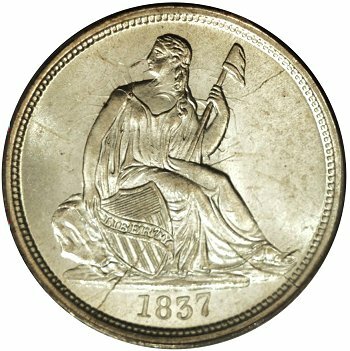 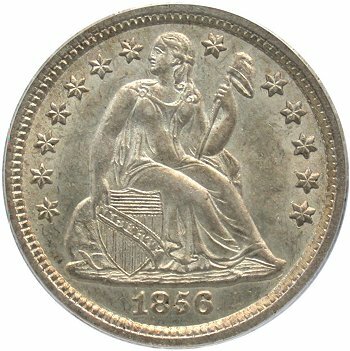 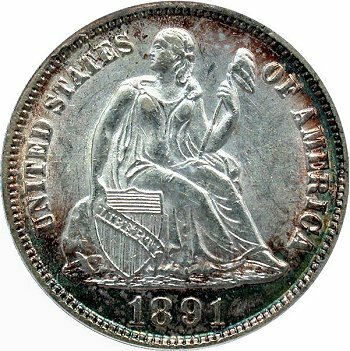 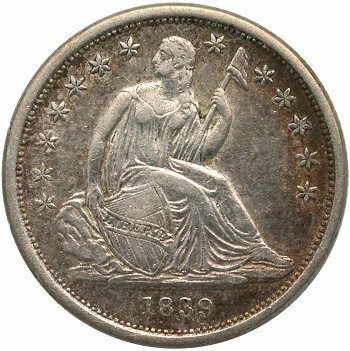 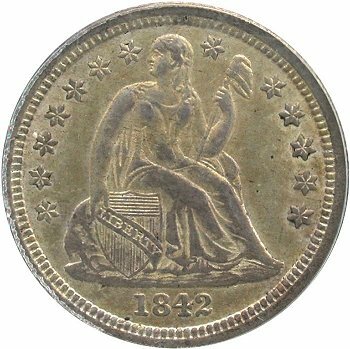 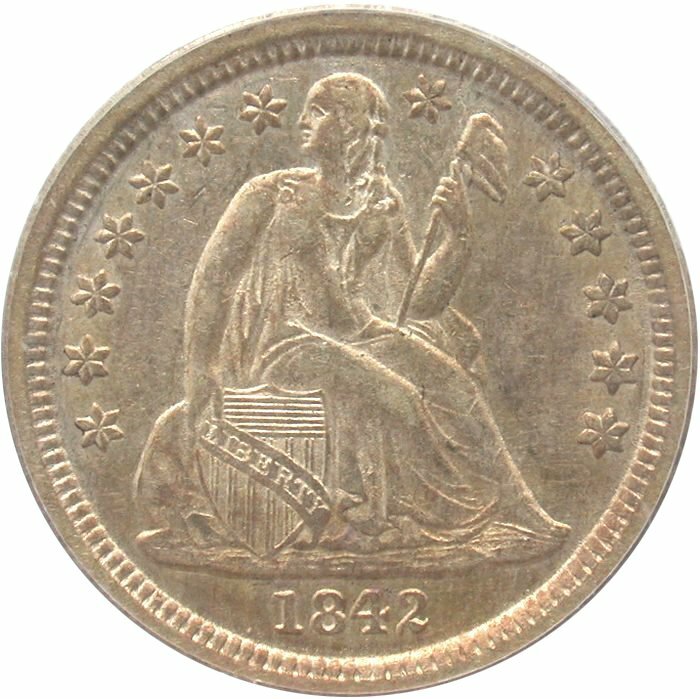 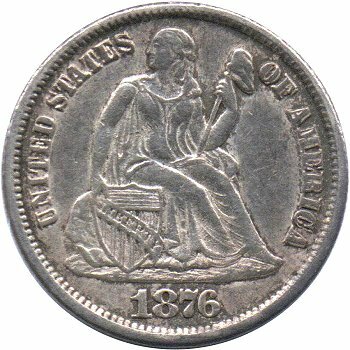 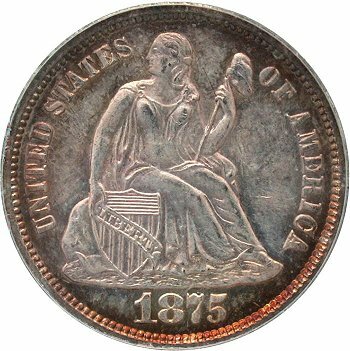 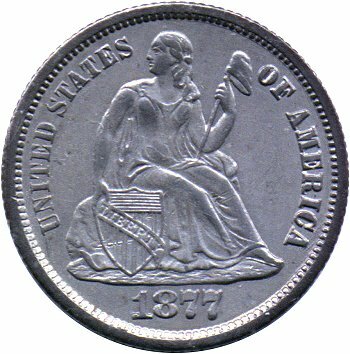 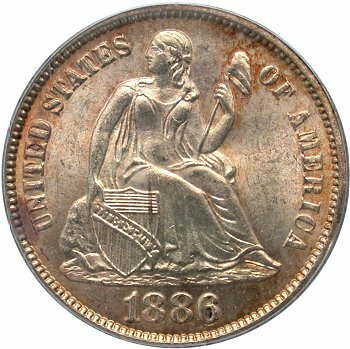 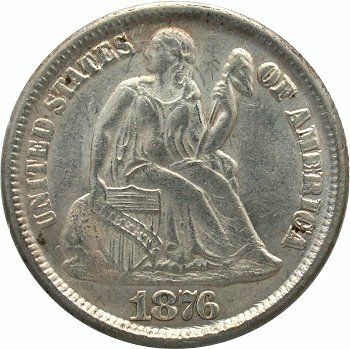 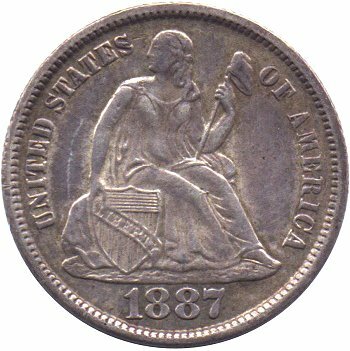 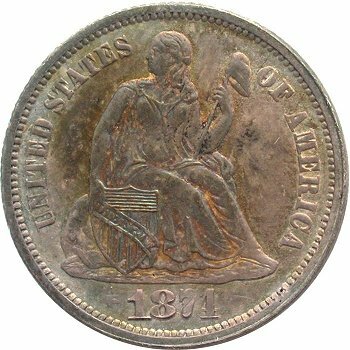 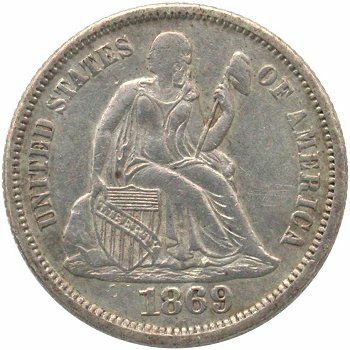 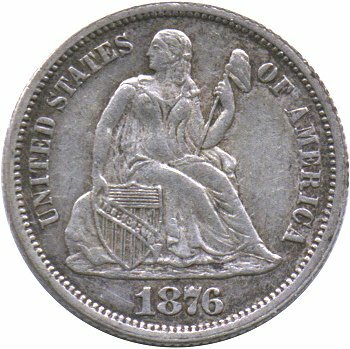 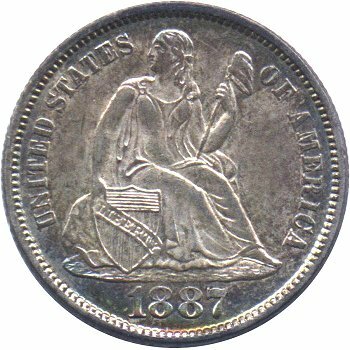 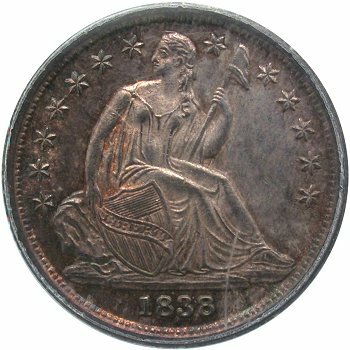 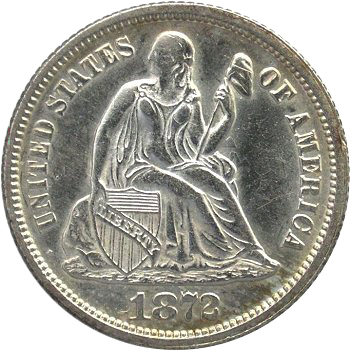 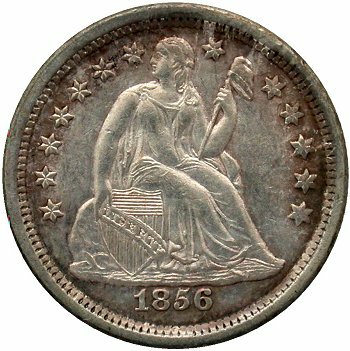 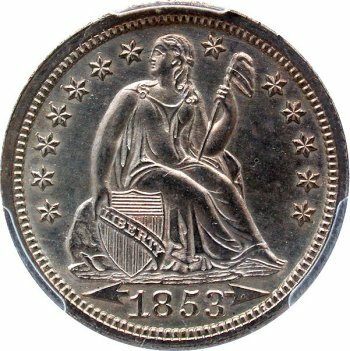 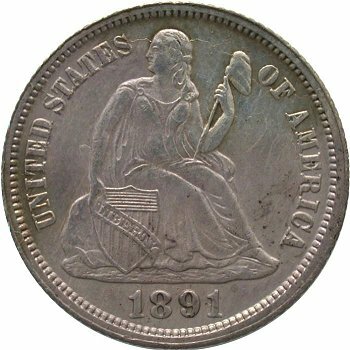 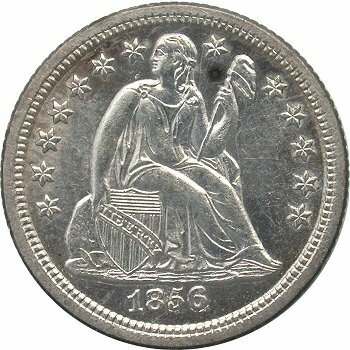 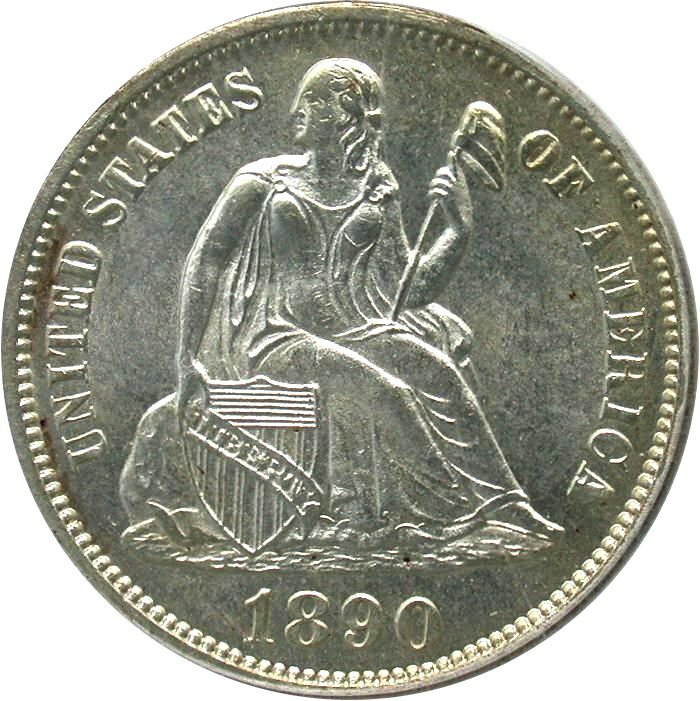 The pairing with Obverse 6 is typically found weakly struck with poor head details. Repunched 89 Digits, Clashed Dies, repunching in the lower loops of the 8 and 9 digits remains clear in the later die state. 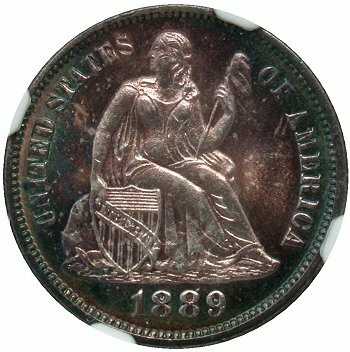 The mintmark has internal anomaly that could be residual repunching. 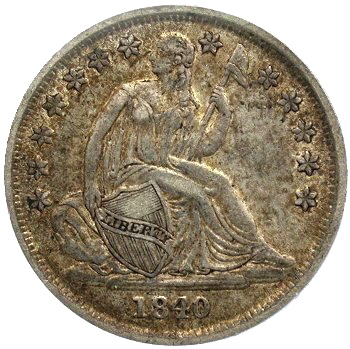 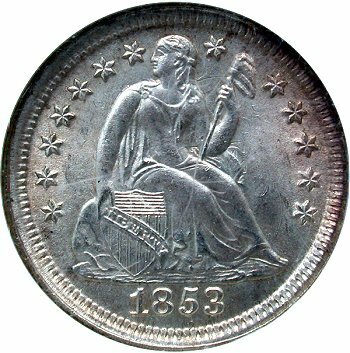 A Top 100 Liberty Seated Dime Varieties template was created at the NGC Registry website by using the Signature set creation option. 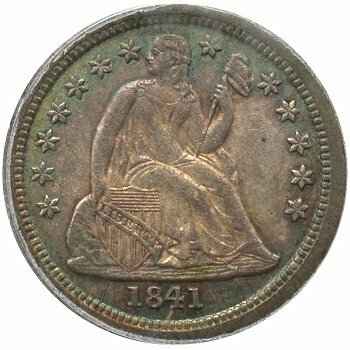 NGC's pioneering approach to the creation of custom Signature sets is enabling collectors of all means to exhibit their sets on the web. 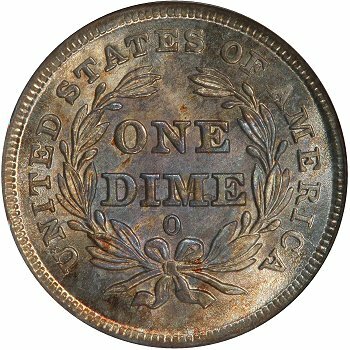 By using the Signature set creation routines, I was able to construct a template for other collectors to use as a display or inventory system. 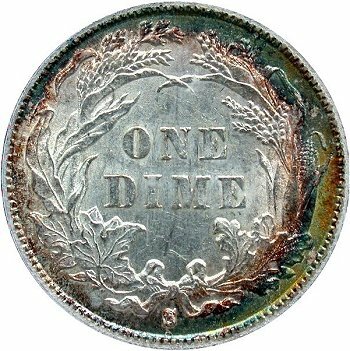 Of course the limitation is that your dimes must be slabbed by either NGC or PCGS. 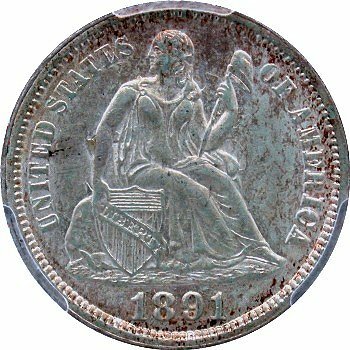 If you are a collector of raw coins, then you might consider using the PDF inventory tracking sheets that I've created. See them below. 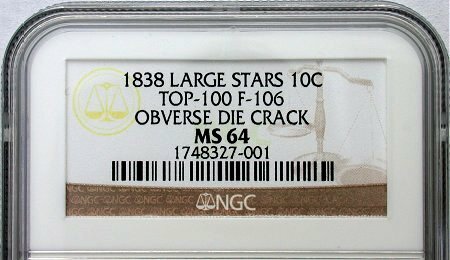 You can access the NGC Signature Top 100 Variety template here at the NGC Registry site. 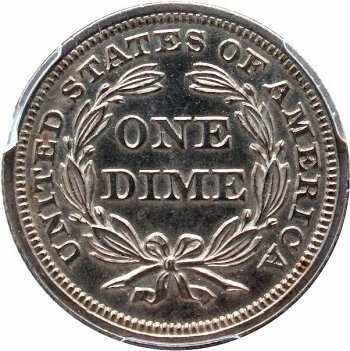 Top 100 tracking sheets for general usage can be downloaded here. 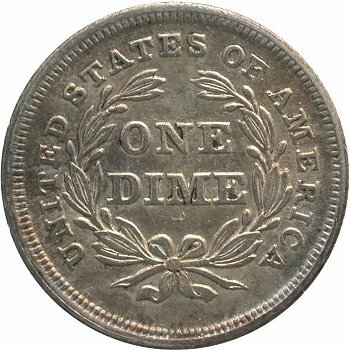 These sheets can be printed with Adobe Acrobat Reader. 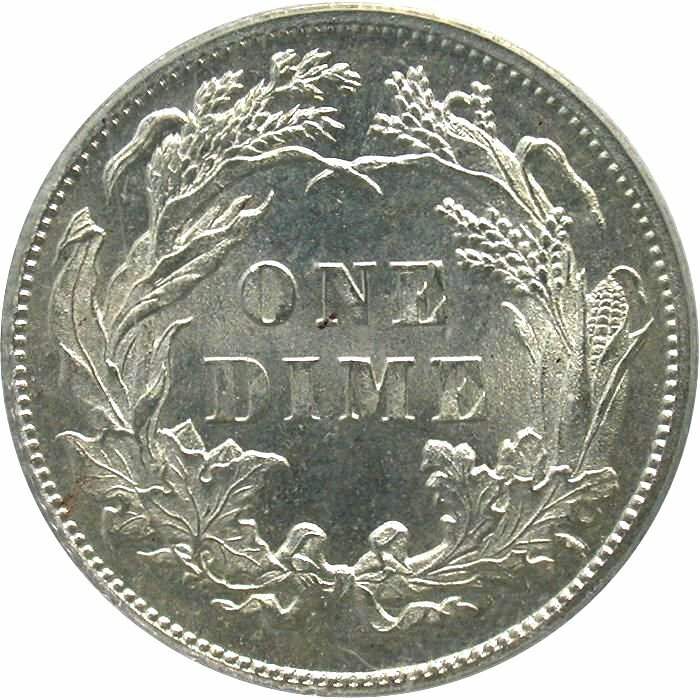 If you would like the Microsoft Excel worksheet versions, just send me an email at wuximems@hotmail.com! 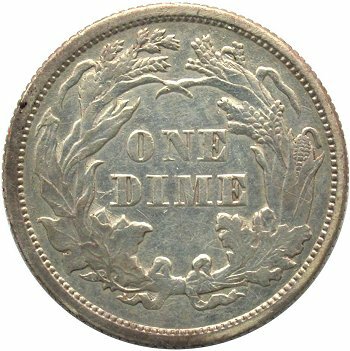 In early 2006, the Liberty Seated Collector's Club conducted a Top 100 Liberty Seated Dime Varieties survey among its club members. 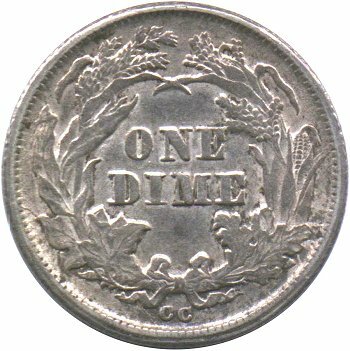 The survey was the first opportunity to test rarity assumptions across the broad spectrum of Top 100 varieties published in late 2004. 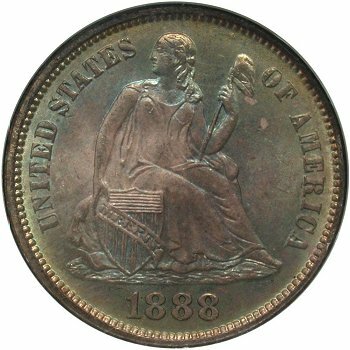 A report of survey results was published in the November 2006 issue of the Gobrecht Journal. Included in the Top 100 survey article were tabular results of the survey outcome. 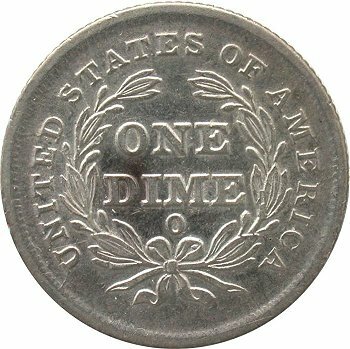 You can find those results in the following table. 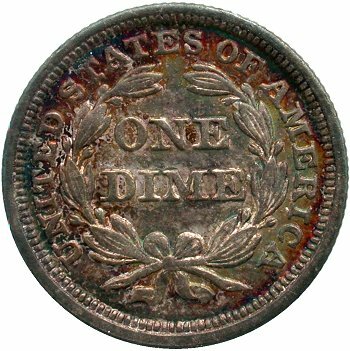 The Rarity Weight column is an attempt to define the relative rarity of each variety against the overall Top 100 listings. 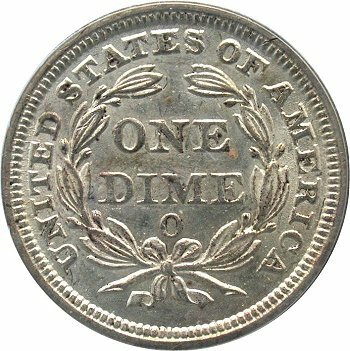 Rarity Weights range from 1 (most common) to 10 (excessively rare). 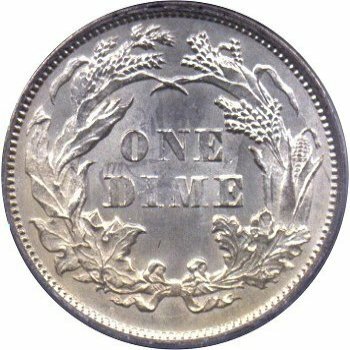 These Rarity Weights will be use for additional analysis in the future.